Thread: Rush: Did You See the Raid at Greg Craig’s House? RUSH: You know what I did last night? I wasted a bunch of time. I really did. I went online, and I tried to find pictures. I tried to find video. 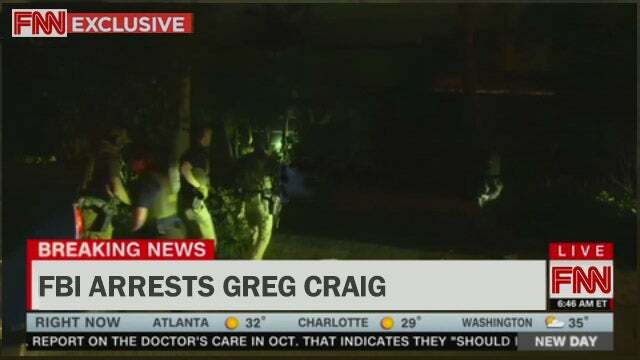 I wanted to see if CNN was at Greg Craig's house. I wanted to see if CNN was at Greg Craig's office. I wanted to see the flashing lights and the police cars. I wanted to see the handcuffs. I wanted to see him walked out of his house in pajamas. I couldn't find it. RUSH: I must have been looking in the wrong place 'cause I thought that's how the special counsel and the Department of Justice arrested bad guys. Remember that's what they did to Stone. They did it to Manafort! They stormed in Manafort and Stone's houses at 6 a.m. when they're asleep. They clue CNN in advance so CNN's cameras can be there to get it all. So I thought surely procedure would be followed here. So I was looking for all of that when they arrested Greg Craig. I know it happened during the day yesterday, but that's why I thought by the time last night rolled around, the video of Greg Craig being led out of his office or his house or whatever -- But I guess I didn't look hard enough, 'cause I just couldn't find it. I couldn't find any stories or information or photos, to heck with video. I couldn't even find any still shots of Greg Craig being treated the way Roger Stone and Paul Manafort were. Now, Greg Craig, he was Office of Legal Counsel adviser to Obama. I mean, this guy, he was involved in sending Elian Gonzalez back down to Cuba from Miami when Janet Reno sent him down there to help out. This guy was the creme de la creme of the Washington establishment. Let's go back to something I said yesterday about this. RUSH: So let's now cut to CNN. Yesterday anchor Brooke Baldwin, infobabe, Brooke Baldwin and senior justice correspondent infodude Evan Perez talking about the indictment of Greg Craig. BALDWIN: ...just - just took down Obama's White House counsel? I mean, doesn't - doesn't this undermine the president's claim? PEREZ: Yeah, I mean, I think that it - it does. RUSH: See? These people are so predictable, they are so transparent. That's exactly why Greg Craig was indicted, and I'll betcha we're not gonna hear -- something to do with Ukraine. We're not gonna hear much more about this. But it's exactly so that these sycophants at CNN could say, "What do you mean a partisan hitch hunt? 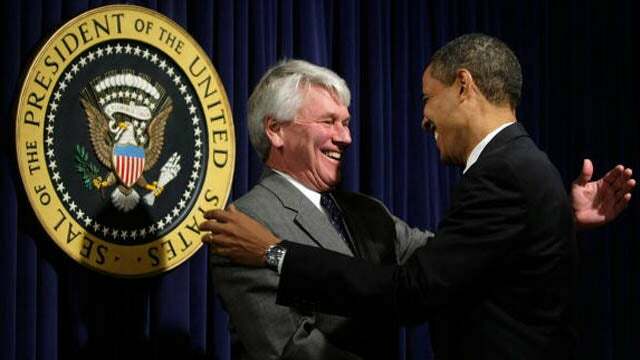 Why, they just took down Obama's White House counsel, Greg Craig." See, it's not even possible that Greg Craig may have committed the crime. No. This is all done just to show that the special counsel and investigative services had no bias. Look, it’s not a big deal. I'm just telling you, I looked for the video and I didn't find it. Folks, it's great to have you here. It's Open Line Friday. You know what that means. It means if we go to the phones today -- we will -- you can talk about pretty much whatever you want. Now, yesterday when Greg Craig was indicted, I gave people a brief history lesson as to who the guy is, because when I say he's in Richard Ben-Veniste territory, Richard Ben-Veniste is one of the lawyers in the Watergate thing, he's untouchable. Richard Ben-Veniste, if you want to think about deep state, Washington establishment, you've gotta think of this guy and people like him, lawyers and so forth. Greg Craig is one of these guys. And to go to the history lesson, I reminded everybody that shortly after Obama was inaugurated, like a day or two later, he has this flurry of executive orders that he's issuing and he's got his staff standing behind him, and when it gets to one particular executive order, Obama is not sure what it says. So he turns to Greg Craig. This is audio sound bite number 3 and 4 to explain it all. RUSH: They're gonna let all the detainees go at Club Gitmo. That was the first thing they had to do 'cause, you know, we're running a torture center down there during the Bush administration. So the first thing to do is let the bad guys go to make sure people like Ilhan Omar do not call us a terrorist country. I mean, even back then nobody knew who Ilhan Omar was except for her husband and family. Believe me, they knew. But none of us back then knew who she was. But it was to make sure -- of course, in the Obama years, the United States was the bad guy in the War on Terror, make no mistake about it. It was our fault, what did we do to anger them. So here's Obama with his executive order releasing detainees, dispose of the detainees, and they had to ask Greg Craig what it says. So this whole little thing continued. CRAIG: That's right. And detainee policy going forward. OBAMA: And detainee policy going forward so that we - we don't find ourselves in these kinds of situations in the future. 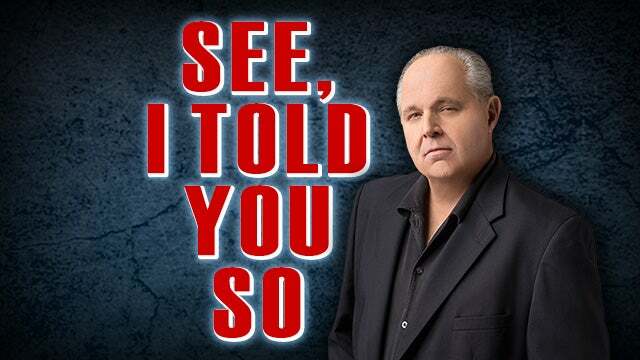 RUSH: So this guy was telling Obama what to say, and Obama was saying it! Anyway, that's who was indicted yesterday. The estimable Greg Craig of the Washington establishment.